Besides design, specs and street cred, there is another important variable to explore while choosing a phone - value retention. What good is the snazzy flagship you paid close to a grand for, if a few months after its introduction it would have become an upper midranger, and, more importantly, lost a whole midrange price tag in value? This is why we were curious to follow if last year's flagships are ageing gracefully. After all, 2017 was the year when average phone prices hit a record, and there's never been such a price jump year-on-year, thanks mainly to "1K" phones like the iPhone X and Note 8, but also to other high-ends that saw a price boost compared to their predecessors, and the trend seems likely to continue this year. Barring BOGO deals and temporary promos around shopping events like Black Friday or Amazon Prime Day, we took the lowest price we could find from a reputable vendor, the phone maker, or in carrier stores, and threw in current average second-hand price from Amazon, Craigslist or refurbished listings for comparison. As you can easily deduce from the table already, the iPhone X is the phone that held its value best since its November launch which was recently confirmed by the wholesalers from B-Stock. They mentioned that the second-hand lots show just 15-20% value drop in these 9 months since its introduction which is a pretty breathtaking retention, even though we start from a higher value compared to other handsets. The Note 8 started pretty high, too, but shed more dollars off its price than the S8, so word to the wise for S Pen lovers. Samsung's Galaxy S8 held up pretty well and fell down just 20% in price for more than a year since introduction, and with a shiny successor on the market. Its second-hand pricing is also above the 50% value retention which seems to be the telling mark whether a phone has been a relative sales success or not. The other way to keep the value of your handset on the Android side of things is to get a Pixel, as, apart from a few promos for a Benjamin, the high-end Pixel 2 XL still goes for the same money it went, though you can save about 40% if you get it used in mint condition. The worst offender seems to be the LG G6, which has lost 50% of its pricing so far, and even more as a used handset, but that was pretty much expected given the older generation chipset it shipped with, while the V30 is doing better. Contrary to the absolute numbers here, though, the G6 price depreciation is not the worst one. 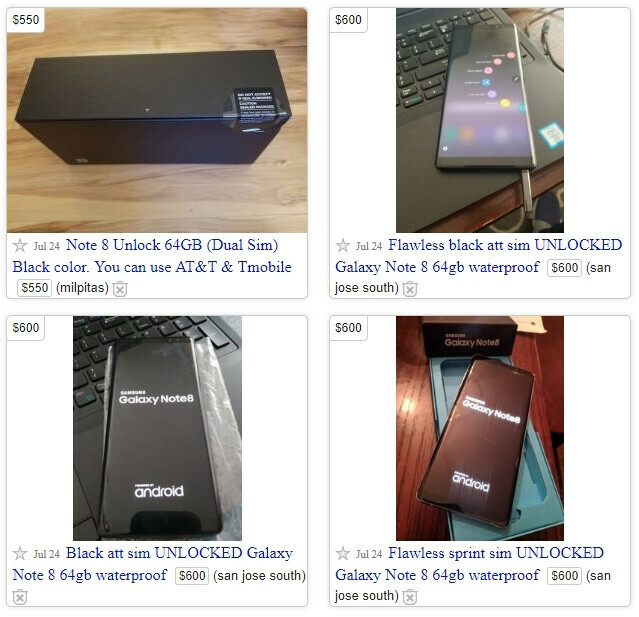 When we account for the fact that the phone shipped way back last March, and its starting tag wasn't that high to begin with, another phone climbs up the totem pole for the title of "worst resale value." We divided the dollar loss from the launch prices to the current average prices you can fetch for second-hand handsets in good condition, and divided the result by the number of months the phones have been on the market. Thus, as you can see from the chart below, the Galaxy S8 has been shedding the least value each month for its lucky users, while the Mate 10 Pro owners have been paying nearly twice per month for the privilege, and something tells us they can complain on "national security" grounds for that rapid depreciation. I get the idea behind it, but using the latest flagships from 2 brands and ones a generation behind for others really skews the data. At the very least it should also include the newest devices like the S9 and G7. What would G7 show? It just started selling a month or two ago. iPhones are great in holding their value within the 1st year of their release, but once their successor is released, then, and considering the high prices they're released at, they lose so much of their value in the next year. A proper study would've compared the iPhone 7, S8, G6, and Pixel phone. Not really. I still see iPhone 7/7 Plus sell for $350-$550 depending on specs. The equivalent Galaxy S7/S7 Edge, LG G5/G6, Pixel are selling for $150-$250. LOL. It always a great idea to buy LG and Samsung phone 3 months later. They can retain their value. Only android flagship phone worth the money is pixel. I want to see the new 48 Megapixel Sony in pixel 3. Google will easily humiliate other andorid phone maker ( samsung) with a single camera if they use that sensor. They’re charging a premium for a “niche” device that doesn’t cater to the mass consumer base. But let’s be honest, the only difference between the Galaxy line up and Note line up is the pen and some software related to it at this point. When I buy a phone, I wait til AFTER a new launch, then buy the last of last years new model. Considering typically how slow vendors are to release updates, they usually have most of the serious bugs squashed, and, the phone will run 99.99% of everything you need, and you don't get hit so hard in the wallet. Better bang for the buck for what I use a phone for. I really think we should appreciate the flagships that lose most of their value in their first year. A year old flagship is still an awesome phone, and you save 50-60% of its price. Sadly Note 8 lost nowhere near that value where I live, hope they announce Note 9 soon so that N8 price can tank. I think these prices are not realistic if it's based on the prices and discounts on the Amazon site, which is not accurate, especially LG's prices are higher than this. I think the S7 specially S7E has hold up quiet well n after Oreo update it's like a S8 or S9 with bezels. If you are the kind of person who change phone every yr or so, then it's best to stick with Apple. iPhones hold their values the best. Nothing comes close.